Ravi Tangri (CSP), has invested his whole life studying and applying the science of success. Tangri helps individuals, teams and organizations identify the key habits, systems and processes that play a key role in what limits and increases engagement, productivity and accountability in today’s fast changing working environments. Ravi Tangri has earned the Certified Speaking Professional (CSP) designation, the highest earned designation for the speaking industry and he was the 2011 national president of the Canadian Association of Professional Speakers. He has an M.Sc. in nuclear physics and an M.B.A.
Tangri’s background as a nuclear physicist is where he first honed his skills in how to simplify complexity and chaotic systems – learning how to find and use the leverage points that make everything transform. This expertise is the lens he uses in the corporate arena to help you grow your co-creative leadership skills, engage key stakeholders and find the leverage points to co-create win-win-win solutions to the complex challenges you face. While he uses quantum physics to create innovation, his solutions are refreshingly easy to understand and have been helping leaders navigate their complex worlds and generate solid results for over two decades. Ravi is the Chief Rocket Scientist for Chrysalis Strategies Inc. and the author of ‘Leading Authentically’ and ‘StressCosts Stress-Cures’. Whether he is growing co-creative leadership to transform the health care system, helping the largest liquid natural gas company in the Middle East grow its leadership, or helping entrepreneurs develop strategies to address today’s fast-changing world, Ravi Tangri helps leaders navigate the complex challenges they face today. On top of this, Ravi Tangri is a master facilitator, with the ability to engage all they key players in the meaningful conversations they need to have to collectively co-create the way forward. Because the ideas he catalyzes originate with his clients, team buy-in and ownership results in innovative solutions that actually work. He has a solid track record of results both working within organizations and from the outside as a consultant, coach and facilitator. Ravi Tangri ensures that his audience not only gets inspired during his talk but does it in a way where they’re able to apply their learning immediately within their organizations as well as their personal lives. Business has hit the perfect storm. We’re moving into the biggest labour crisis in history as the baby boomers move into retirement, and the younger generation has different demands and expectations. On top of all of this, change is coming at us faster and faster. In this world, a new form of leadership is evolving – co-creative leadership, where you engage all the key players to co-create the way forward, building in buy-in and commitment. Co-creative leadership is one of the foundational keys to moving from a business with a "meh" culture to a dynamic, thriving "Yeah!" workplace, and Ravi Tangri is an expert in co-creative leadership and helping his clients engage their team or organization to quantum leap their performance. 3 key leverage points for moving from "meh" cultures to "Yeah!" Many people think that mindfulness is some esoteric quality that you get meditating on a mountaintop or in a yoga studio. The reality is that it's your your ability to be focused on the task at hand instead of lost in your "monkey mind" thinking about a hundred things at once, or lost in the monotony of what you do. Meditation is one method to build your mindfulness "muscle", but there are many more ways to be present and effective. Mindfulness has been proven to increase output and project outcomes, enhance crisis management, build relationships, enhance creativity and much more for leaders and teams. Ravi Tangri has invested his entire life learning how the mind works and shows you how you can overcome the two main barriers to mindful work - your "monkey mind" (head chatter) and mindlessness (zoning out with the monotony of the task or meeting). He'll also show you how you can engage your team to be more connected with meetings and their work. Too many organizations and people are concerned with what they do. And as times get more challenging they focus on more ‘what’ – new strategies, new org charts, new products/services for organizations, new goals, new accomplishments and as individuals, new possessions. And after all that, they now have to work incredibly hard to motivate themselves to do all these things, because they're stuck in the "meh" of it all. In contrast, high performing organizations and individuals don’t start with ‘what’ they do. They start with ‘why’ – their higher purpose, or the difference they make in the world. That’s where true motivation starts within organizations and groups of people and where you'll finally get buy-in and commitment comes from others. Instead of working to motivate yourself to realize your goals, you start with what motivates you and then sculpt your goals and your vision from there. That’s the power of purpose that enables you to boldly go forward. The benefits of mindfulness include better health, healthier relationships, increased life satisfaction, improved performance at work and much more. Ravi Tangri has invested his entire life learning how the mind works and shows you how you can overcome the two main barriers to mindfulness - your "monkey mind" (head chatter) and mindlessness (zoning out with the monotony of the task). He'll show you simple processes to be more present and mindful in every day life. If we tell you not to think about blue chocolate, what happens? You think of blue chocolate. Your brain can't make a picture of a negative, so when you say you don't want something, you actually create a picture in your mind's eye of what you don't want, and motivate yourself to make that happen. That’s one of the biggest mistakes people make in setting goals – focusing on what they don’t want, not what they want - and they set themselves up to fail. There’s been a lot of attention put on goal-setting and the Law of Attraction yet people are still struggling to create the results they want. That’s because most people keep making the same mistakes. Ravi Tangri has invested over 35 years learning the science and art of creating the results you want, and he’s laid out the 5 biggest mistakes people make (like focusing on what they don’t want), and he shows you how to avoid them to move your life from "meh" to YEAH! If your people don’t build action plans to apply what they’ve learned at their meetings, the wave of busyness that greets them when they get back to work overwhelms them, and their notes sit on a shelf or in a file. There are proven processes and approaches to drive up engagement at meetings and help participants leave with a clear and solid action plan. With a tested process such as a World Cafe or an Open Space meeting that can engage hundreds and thousands of individuals and allow them to generate personalized action plans that are ready to move forward with when they return to work. Ravi will ramp up the effectiveness of your conference or meeting and help every participant develop the first steps to actually apply what they have learned from the rest of your meeting - move your meetings from "meh" to YEAH! Change is the way of the world today. There’s nowhere you can hide from it, so how do you deal with it? How do you support your team through change? And how do you find the support you need as a leader? With over a quarter century of change leadership, Ravi Tangri lays out the journey of change and what people need at each stage to support themselves. Equally important – and often overlooked – is how you get the support you need for yourself through this journey. Ravi Tangri has designed and implemented effective innovation across North America. His success comes from building commitment throughout the organization and making the innovation relevant to the employees who have to make it work. Ravi is a founder of Chrysalis Performance Strategies Elimination Technology TM , which has reduced absenteeism by over 27%. He is the creator of Chrysalis' breakthrough facilitation process, Genesis, used to build the cultural systems that recover productivity lost to stress. 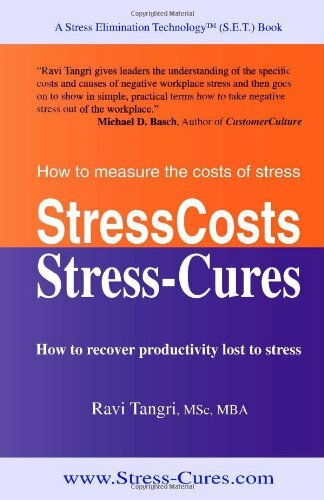 This book shows you how to calculate what stress costs your organization's bottom line. It then guides you through the two strategies to recover productivity lost to stress. Forbes "No, The Customer Is Not Always Right"
Ravi Tangri is able to combine the science of thought with highly creative experiential processes to move a group or individual to improved performance. Ravi honestly cares about providing real value to everyone he deals with, and makes sure he has lasting impact each and every time. Ravi's approach is very effective and we were pleased with the results of the process. His approach to strategic planning makes the process very engaging for everyone involved.